Time for my less-than-regular segment! Today its about True Blood, which I would argue is currently the hottest show on HBO, and I don't think too many people would disagree. With the 3rd season coming out on DVD soon (May 31st, 2011) and the 4th premiering not too long after (June 26th, 2011) I thought now would be a good time to look back at the second season. Why not the first? Well, it was good, but I feel the show didn't really get great until the 2nd, as will now be discussed. First off, if you've never watched True Blood I'll explain a few things. It's basically about a world that is just like ours but where vampires have come out as existing now that synthetic blood has been created. The show takes place in the deep south with a psychic waitress named Sookie Stackhouse and there is a whole interesting cast of characters ranging from her love interest, a vampire named Bill, to a mean-yet-attractive vampire named Eric, and a whole mess of other folk. Really, if you haven't ever heard of the show I'm not the best person to try and break it down for you, go read up on HBO maybe. This season basically exists in three acts. It first wraps up some of the loose threads from the first season, moves into the meat of the season where Sookie has to go to Dallas to find a missing vampire named Godric who may have been kidnapped by vampire-hating humans, and the last few episodes bring a simmering sub-plot to the forefront with a bunch of supernatural stuff occurring. I've always liked True Blood the most when it is trying to be realistic. I know, I know, what is realistic about a world full of vampires and other supernatural beings? What I'm trying to say, is when the show goes with a metaphor of the vampires as a hated minority, which is when things are interesting. That is probably why I most enjoyed the middle of this season when Sookie and crew go to big city and deal with the prejudice against Vampires--and we see the opposite side of the view while Jason coincidentally works with the very same people not knowing Sookie is involved. Needless to say this leads to issues later on. Don't get me wrong, the show is still good when it has all the crazy supernatural stuff, I just like the more down-to-earth bits. The acting is great, the plotting is good, and the show knows when it shouldn't take itself too seriously either. I really do enjoy this show and hope it has a long and successful run. 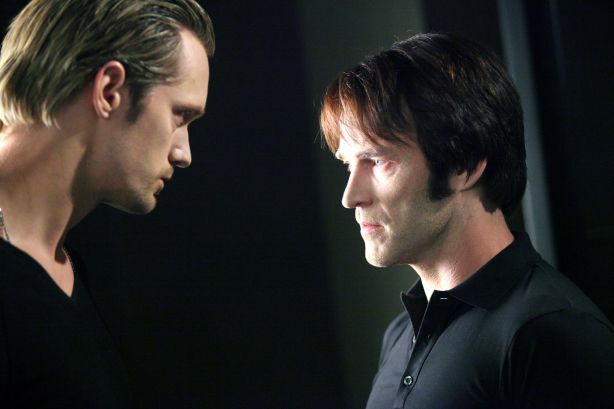 Oh, and in case you were wondering my favorite episode of this season is the eight, "Timebomb" because it brings a lot of story-points to a head and has the best cliff-hanger of any episode I've seen of True Blood in any of the seasons so far. Anyways, you should rent the first season on DVD, enjoy it, and then get ready to have even more fun with the 2nd.